Riggerloftets are a group of singers who, unusually for shanty groups, have their own boat which they use to travel to local festivals in Norway. Warp Four can trace its origins back to two acappella groups formed in the 1960s and 1970s (Garland and The Press Gang). 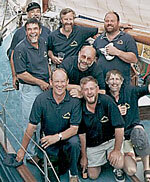 Warp Four itself was originally formedin 1991 and was the first dedicated Irish Shanty group. In 1998, they recorded two albums with veteran Irish folk singer Liam Clancy: The Wild and Wasteful Ocean (Warp Four are thebacking singers throughout the album) and One Hundred Years Ago (Liam provides a guest track on this CD). Theydisbanded briefly in 1999 and reformed in 2002. Since then they have sung their mix of sea songs and shanties all over Ireland, Europe and beyond. The Albaquirky Turkeys play a great mixture of folk, rock, roots and traditional and the six band members play the usual instruments such as guitars, mandolins, harmonic but they also play yokes called congas. A comment on Facebooks states that "they have more bummers than a haemeroid clinic but they are great nonetheless" (a compliment no doubt!!!). South by South East are a group of musicians who meet at sessions in Tramore. They are: Eamon Duffin, Jimmy Duffin, Mark Nugent and David Walsh. They play traditional Irish music with banjo, guitar, button accordion, whistles and mandola and they sing traditional and modern Irish ballads, folk, country, pop and comedy songs and songs of the sea. City of Waterford Brass: Originally founded in 1932, City of Waterford Brass has contributed hugely to the musical life of Waterford, down through the years. It has provided players for the Waterford Orchestral Players, the Light Opera Festival, the Waterford Grand Opera Society, and many professional national orchestras. In addition the band provided players to the many dance bands which originated in Waterford during the sixties such as the famous Royal Showband. In 2009 the band launched a CD of live recordings of the band. The Thomas Francis Meagher Fife and Drum Band The Thomas Francis Meagher Fife and Drum Band was founded in Waterford in 1885. The band has always been affectionately known locally by it's followers as The Yellow Road Band as the band's headquarters are situated on the Lower Yellow Road but when the band travels and for official engagements it's proper name is re-established. In 1996, 1999 and in 2007 the band, travelled to the USA and marched in St. Patricks Day parades in New York and Boston. 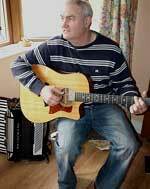 Eugene McCabe: Eugene called "Geno" is a great lover of traditional music and song and accompanies himself on guitar. Geno sings in a strong melodious voice that fills any sized tavern or venue. 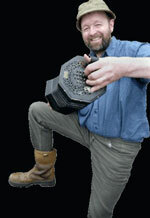 He plays usually around North Dublin and Meath and his favorite number at present is his version of "The Irish Rover". Dylan Bible, Owen Dunphy, Niall Byrne.